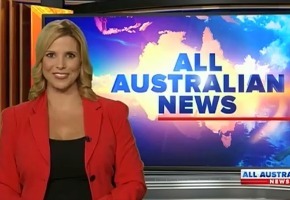 The WIN network yesterday launched a one hour midday news bulletin on GEM, All Australian News anchored by Amy Duggan. Drawing upon regional news items, it claims to be Australia’s first national daily one hour bulletin focused entirely on the issues affecting regional Australia. WIN network CEO Andrew Lancaster explained some of the challenges in regional news. “Many networks deliver a mid-morning or lunch time bulletin. However inevitably – because of the location of the news crews – these services tend to focus on the major metropolitan areas. “The large number of our reporters, camera operators and editors – strategically located across the length and breadth of regional and rural Australia – means no other network has the capacity to tell the stories that are important to these communities. This has been on air two months, and I still can’t get over how much of a pointless exercise the “All Australian News” is. WIN can spin it as much as they like, but this was clearly an attempt to hide a cost-cutting exercise. WIN axed the state editions of their late news and replaced them with just one bulletin (“All Australian News”) – an even more generic and irrelevant amalgamation of stories from their evening bulletins. The “bulletin” that airs at midday on GEM is an outdated repeat from the night before. @Kenny, while WIN has operated in SA for years (and even owned Nine Adelaide for a while), it axed all it’s SA news production last year. The regional WA bulletin went the year before. So Maverick’s perception of the geographic scope of the program is correct (unless it purchases footage from non-WIN sources). @Maverick – WIN has stations in regional SA, regional WA (Kalgoorlie, Bunbury, Albany, Geralton) plus WA satellite-to-home service. @Shoudy Chen – Dunno. Check their program guide. How can they call it All Australian News? Correct me if I’m wrong but I didn’t think Win operated in WA, SA and NT? Wouldn’t that make it All East Coast Australian News? Does the WIN Midday News apply to regional WA? So is this the first step in scaling back any nightly news bulletins in some markets… i mean if they just produce a news bulletin sometime each day does it have to go to air at a time in the early evening? and will it fullfill the governments requirements? Pretty silly having it on at midday when nobody’s watching. I much preferred WIN’s former late night bulletin where Jeff Phillips presented the best stories from WIN’s southern NSW regional bulletins.